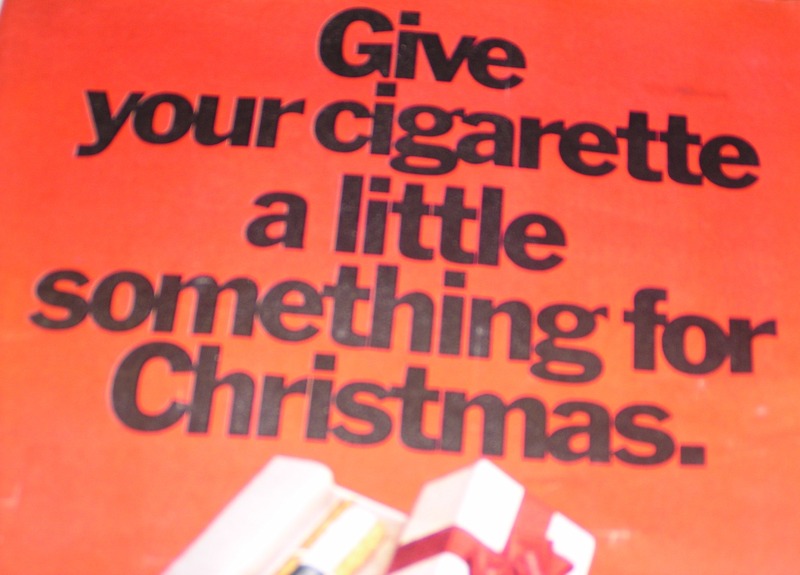 On this day in art history, Gustave Fielder’s painting Christmas ’69 first appeared on the back cover of the Friday MidAfternoon Post. 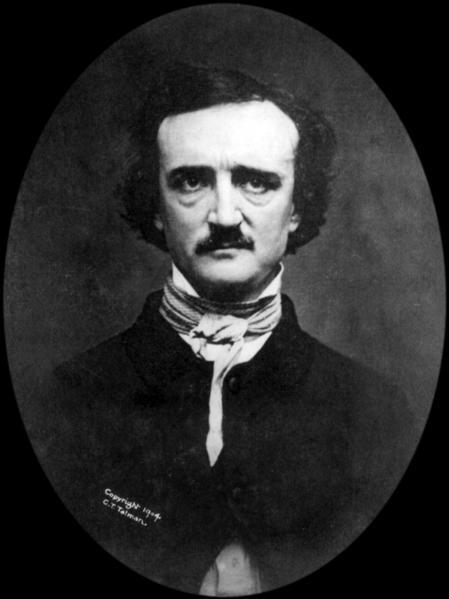 On this day in art history, “The Raven” appeared in New York Evening Mirror and was, for the first time, credited to Edgar Allan Poe. On this day in art history, the Italian-American painter L. Marie Marchi completed her painting, Four Figures On A Step featuring Hello Kitty. 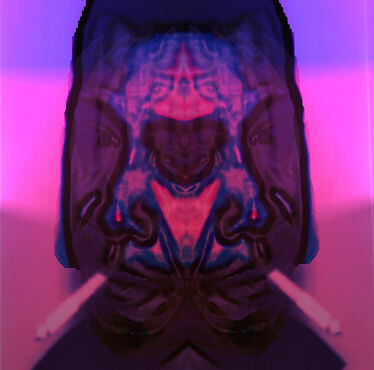 The Two-Faced Smoker remains a lost piece of art. On this day in art history, the Italian-American painter L. Marie Marchi completed her painting Pope Joan At Via Scara featuring Hello Kitty. 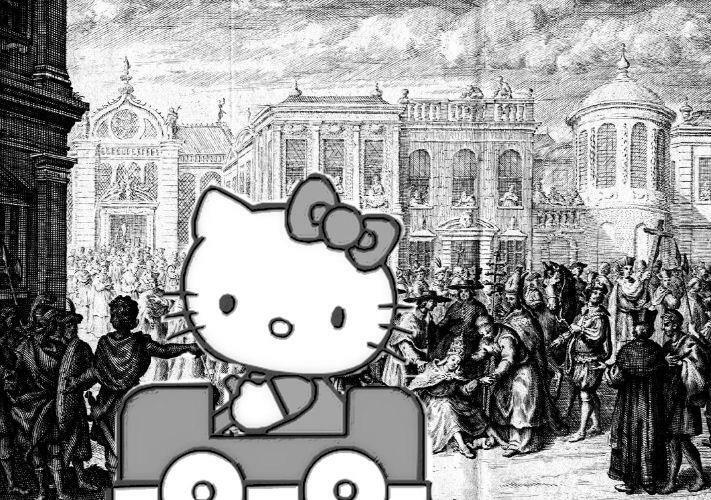 The painting depicts the legendary Pope Joan giving birth in the middle of a papal procession while Hello Kitty drives by. 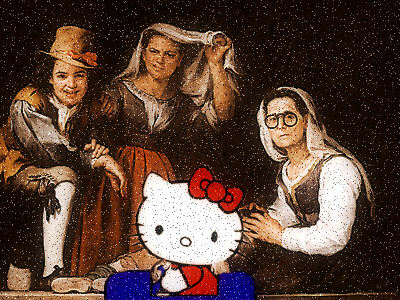 This painting, the first of Marchi’s featuring Hello Kitty series, currently hangs in the Denton Museum of Art (DMA) in Denton, Texas. Though originally dismissed by art critics, Pope Joan At Via Scara featuring Hello Kitty subsequently became very popular with the public when a copy of the painting was used to decorate the cafeteria at St. Monica Catholic School in Dallas, Texas. This copy was seen by a few members of the Walnut Hill Catholic Wives and Mothers Auxiliary who quickly fell in love with the whimsical yet disturbing picture. The WHCWMA commissioned several t-shirts decorated with the image of Pope Joan At Via Scara featuring Hello Kitty and from there, a grassroots fashion movement was born. Sadly, the featuring Hello Kitty series has been on hiatus since 2002, the results of several accusations of various copyright infringements. L. Marie Marchi has promised that the series will continue once the lawsuits have been settled. On this day in art history, English painter Joseph Serf died in Santa Monica, California. Or did he? In his upcoming book The Serf Deception, noted art historian Dennis Ganz argues that Serf faked his own death in order to increase the value of his paintings at auction. According to Ganz, Serf is currently known as Silvio Marchi and is living in a secluded villa near the Italian village of Melissa. The executor of Serf’s estate, attorney Erica Meehan, has denied Ganz’s claims. On this day in art history, His Holiness Pope Militades died in Rome, bringing his 3-year papacy to an end. 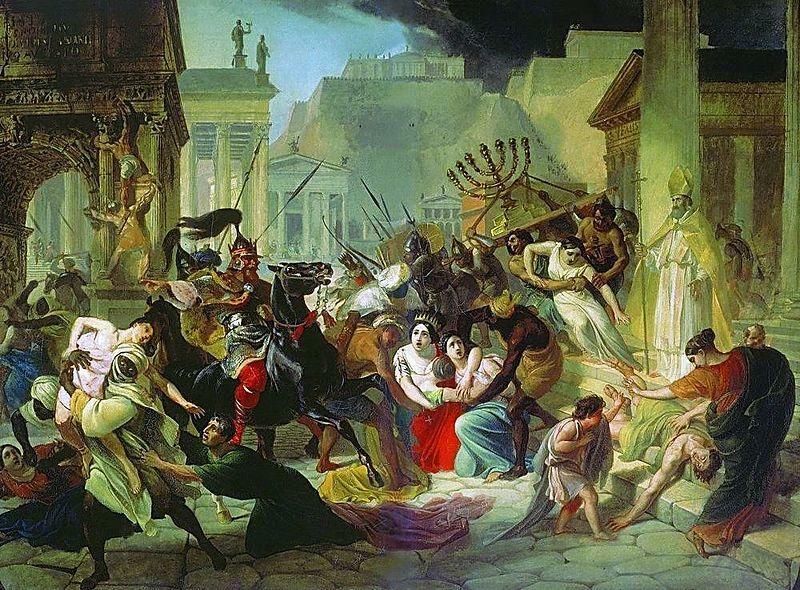 To honor his passing, St. Sylvian of Bystidia began work on his famous sculpture Militades On The Heretics. Taking 9 years to complete, the sculpture was considered to be one of the top 50 wonders of the Western Roman Empire. 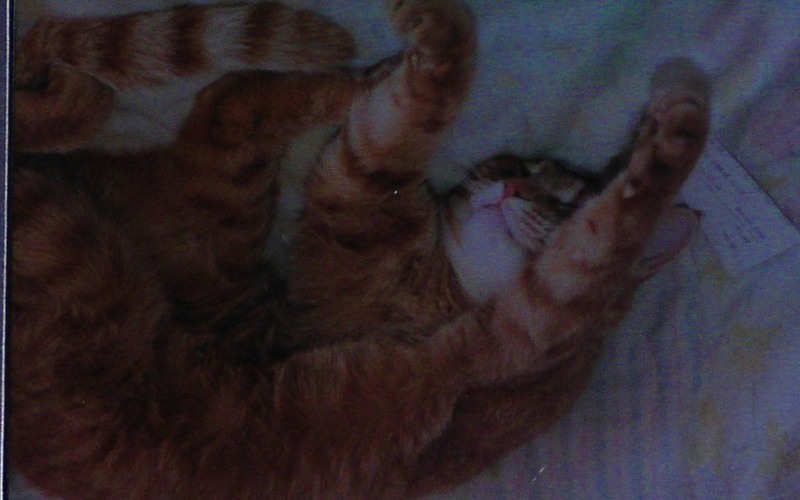 It was subsequently destroyed by the Vandals during the second sack of Rome in 455 A.D.
On this day in art history, the photographer known as Harry first revealed his most famous work — Self-Portrait Of A Tired Kitty Cat. This picture is widely considered to be one of the best photographic self-portraits ever taken by a cat. On this day in art history, the noted comic book artist Sid Melvin stepped into his small Burbank, California home at 8:00 pm, closed the all the curtains, and turned out all the lights. Nobody would ever see him again. The 43 year-old Melvin was best known for creating the character of Mistress Pain for Sleeper Cell Comics. The highly controversial comic book ran from 1980 until 1993. Friends reports that, at the time of his disappearance, Melvin had been upset by the recent cancellation of a Mistress Pain movie. Melvin, who had spoken openly about his lifelong battle with depression and paranoid schizophrenia, was also said to be upset over the inability of any of his subsequent creations to match the popularity of Mistress Pain. Burbank Police, however, do not believe that Melvin killed himself or was the victim of foul play. Since Melvin’s disappearance, there have been sighting of him all over South America and it is rumored that he is currently working as a hitman for a Columbian drug cartel. Below is the last known picture of Sid Melvin. 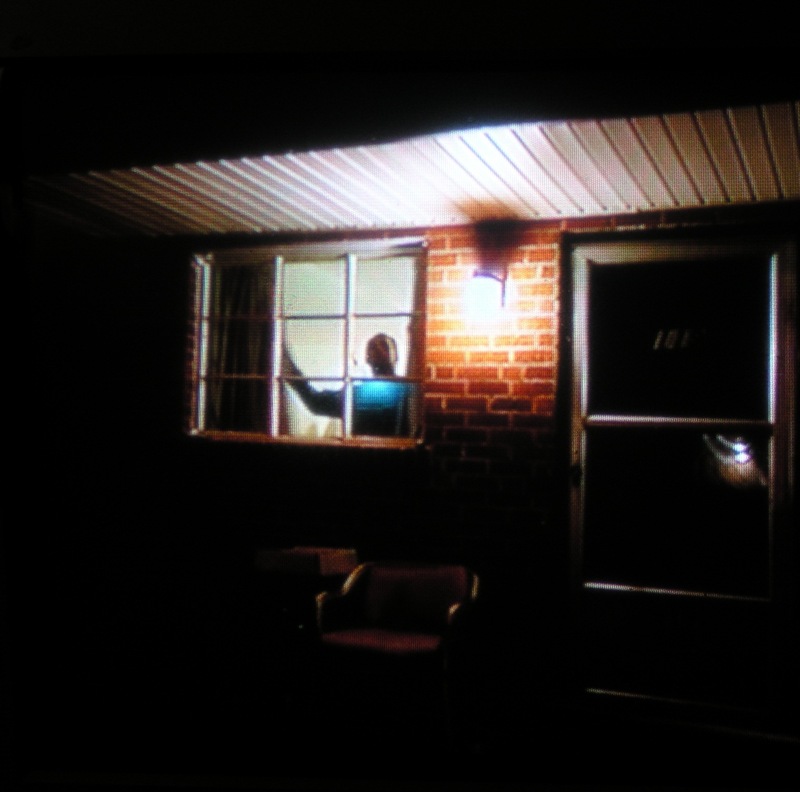 It was taken by his neighbor the day that Melvin disappeared. That neighbor was subsequently arrested on unrelated charges and deported back to his native Samoa. On this day in art history, the American painter Giovanni DeGrasslo first unveiled what contemporary art critics considered to be his greatest work — Al Capone As I Knew Him. 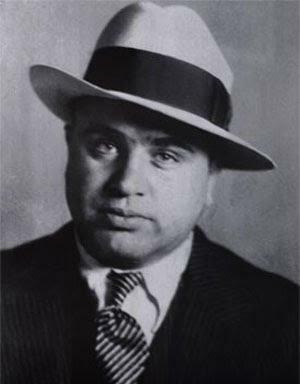 At the time, many observers noted that the painting appeared to be almost as much a self-portrait of DeGrasslo as much as being a portrait of notorious gangster Al Capone. Ten minutes after revealing the painting, DeGrasslo took it out to the alley behind his studio and set it on fire. DeGrasslo habits of destroying his paintings shortly after completing them is speculated to be the reason why he remains largely an unknown artist.